the christmas season always reminds me how special hand crafted gifts are to give and receive. today we find home made gifts to be few and far between. many of the traditional crafts, today being revived as hobbies were once a part of every day life. people used to slaughter their own meat to feed their families, they made soap, candles, tanned leather, crafted furniture and other necessities or traded wares with those who made these things. people medicated themselves with herbs,tonics, tinctures and natural medicines-they had no alternative. today when we want a rocking chair, we buy one. when we need chicken for dinner we go to the grocery store. when we are sick we take a pill (and do we really know what is in that pill?) so far removed from self sufficiency have many become that most people have no idea what is involved in slaughtering a chicken they just know the end product that they purchase from the meat department. it's a shame that in modern times taking the time to re-cane a chair is a luxury rather than necessity. it's time to get back to the old ways if not for any other reason than to see how fortunate we really are. perhaps this will be the year that you try your hand at canning some produce, making paper or reading up on healing herbs to learn where modern medicine evolved from. i'm the type that has always wondered "how'd they make that?" "why'd they do that?" and "what's inside that?" i'm also inspired to know that there are people who still strive to do as much as they can by hand- to the ones who "walk the walk and talk the talk" a salute! what a wonderful christmas was had at the pahls home. my dear sweet little children reminded me, as i experienced the joy of christmas through their eyes, what a blessing i have been given. the best gift this year was just being with them and saving up these moments in my heart. i hope your holidays were as bright. many thanks to all for the gifts, cards, virtual cards and messages that were so warm and thoughtful! Right now I am cleaning up my sewing room which, after getting ready for my last few shows, looks like a tornado hit it. Was recently at Crooked tree hollow and saw frannie's "to die for" sewing room (she calls it her nest) and I was so jealous and inspired by her room that I've decided to clean mine up and put some more dolls and dollie things on the walls. Besides, I want my room really organized and clutter free so that when my supplies arrive to make Shari Lutz's doll head (shown in The Cloth Doll magazine), I will be ready to begin and the doll's head progress will be the center of my attention. with the christmas season i have been thinking that some of my best gifts to folks were not quite so valuable or lovely until I gave them away and then got to see the happiness that it brought to the person who received it. I once had this very old silver bracelet..... gorgeous molded designs... so lovely but I wore it only infrequently because it was so old and unique... I feared losing it.... then one day I decided to give it to my sister, Sylvia. She loved it and she wears it everyday.... it has never looked so lovely as it does on her wrist. I'm always pleasantly surprised to see it on her when she visits... I can admire it for its true beauty....an item that is liked and worn! I am currently only making dolls dressed in BLUE for my 'Winter Blues' collection. 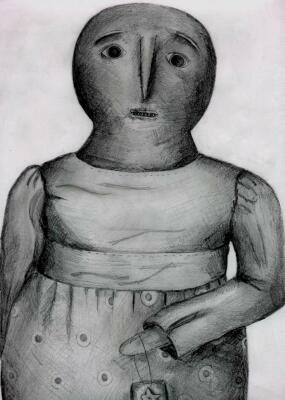 Next month -- I will also make 'primitive Valentine dolls' in wonderful olde reds. My incentive has been my new 'nest' -- some of us call it a sewing or project room -- some call it their 'studio'. It is truly my little 'nest' all feathered with my most favorite 'treasures'. There is not sufficient 'light' or 'table space' to cut a 'fat quarter's worth of cloth' -- but oh my, I have made lots of dollies while lounging on my fluffy pillow-bedecked bed with lots of warm snuggly quilts! I have collections of dolls and antique sewies and quilts and laces and linens and antique baskets and boxes overflowing with sewing items from yesteryear -- zillions and zillions of olde buttons and wooden thread spools and bobbins. Must have 'bout a dozen or so olde chairs in there -- each seat is taken up with a special treasure. I have set up my 'ironing nook' -- an olde wooden ironing board -- several others leaning against the wall -- several children's ironing boards and a huge collection of 'vintage' wash/ironing products and advertising... and about a dozen or so antique wash boards. And!- the most wonderful drying rack -- and another one filled with my 'special' vintage linens. My rug-hooking equipment (with rug in process)... and of course, my inspiration... photos of my dear family and friends! "I went 'antiquing' today for some fun Valentine Red treasures. Got a few cute valentines from the 40's - a dear vintage apron with red hearts all over it -- the most adorable olde 'felt purse' in pure Valentine RED! A child's wooden chair painted RED -- and a couple Valentine hankies! The surprise sell out at this retail show were my garden fairies. I only took them along for "filler"- didn't think they would sell this time of year in Minnesota. They are just a simple doll, about 7 inches tall, painted with pastel sponge painting. I made their dresses from floral or vegetable print fabric. Their wings are opalescent cellophane. The antenna I made from a hairpin. In their hand was a wire with a star on the end, kind of like a wand. Wish I had a photo, but I sold them all before I got any pictures. I thought they would be more for spring. I envy you guys who live in areas with the great shows. I have been selling on a regular basis to the museum in New York and plan to seek out more alternative outlets, as opposed to doing shows. The new doll I have been working on this week is a vegetable head doll. I have been thinking about this one for a long time, but just started the actual construction this week. My biggest problem when I am making a new doll is remembering to slow down enough to make a pattern as I go. Otherwise I get finished and have no idea how to make a second one. I am also trying some bug ideas. I have been working a lot with felt. A few years ago, if you used felt on a doll it seemed to make it more amateurish looking. But I really like working with the felt that is out now and all the great colors. Actually, I have been using white felt and hand painting it for the bugs. It is possible to get a whole different look than when dying the felt. she was making a topsy turvy doll of little red riding hood. she used to make them awhile back... should granny be on the same side of the doll as the wolf so that when you turn her bonnet around its the wolf in her dress (with her flesh colored furless hands)... what about the other side of red riding hoods face, should there be someone in there too? and how could the woodsman be incorporated into this, without him ending upwearing a skirt? any ideas? the new year is a perfect time to organize photographs from years past. did you know that many of the older style photo albums (1960's thru 1980's) are actually harmful to your precious photographic memories? the paper, plastic and adhesive are very acidic. photos stored in albums made a century ago- the kind with rag paper and the photo corners are actually more sound. if using a modern day paper album be sure to attach photos with acid free paste or photo corners. a the best place for storing non-album worthy photos is in a photo storage box . acid free tissue can be placed between layers of pictures. keep negatives in mylar sleeves and label then place in a binder like the kind used for loose leaf paper. stale urine is still used today as a fixative for indigo(blue) dye. oddly enough the urine must be from pre-teen males. shakers used urine to separate cow's milk (for those of you who don't know "straight" cow's milk has to be separated before we get what we buy in the store). once separated they used it to mix with lime and earth pigments to make milk paint. 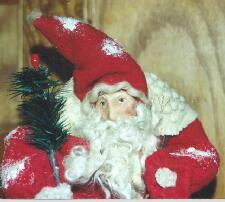 save holiday greeting cards with old time santa or angel faces on them. the faces can be fashioned into ornaments by sewing clothing from cotton batting and adhering the face to the cloth. egg cartons recycle into great storage containers for packing away christmas ornaments that are breakable. in some cases you will want to cut off the top of the carton and just use the base,for smaller ornaments leave the carton in tact. i saw a cute idea in a home decor book. the home owner took tiny heirloom crochet /knitted sox or booties (some were matched,others had only one of the pair) they had them mounted on a colored backing then in a frame/ shadow box affair with glass front to hang on the wall. it was very homey looking. the same could be done with childrens shoes, mittens or gloves. Add 1/3 cup mix to hot water to make one cup hot cocoa. use old animal shaped cookie cutters as napkin holders. select cookie cutters with the little ridge handle on top sliding a bright colored napkin through the ridge. chalice: a container for sacramental wine. firkin: a vessel or keg used for measuring liquids or solids like butter. the term arrives from a british unit of capacity equal to the volume of one-fourth of a barrel. flagon: an early name given to a vessel with handle and pouring spout. keeler: a shallow, round, or oval hooped tub having two protruding stave handles. used for cooling milk. this place will cut custom wood pieces from a design you provide plus they offer an extensive line of pre cut pieces. copyright 1999 maria pahls~the seed pod all rights reserved.